With each passing day, it becomes increasingly evident that US President Donald Trump’s administration cares less about economics and more about the aggressive exercise of political power. This is obviously a source of enormous frustration for those of us who practice the art and science of economics. But by now, the verdict is self-evident: Trump and his team continue to flaunt virtually every principle of conventional economics. Trade policy is an obvious and essential case in point. Showing no appreciation of the time-honored linkage between trade deficits and macroeconomic saving-investment imbalances, the president continues to fixate on bilateral solutions  to a multilateral problem – in effect, blaming China for America’s merchandise trade deficits with 102 countries. Similarly, his refusal to sign the recent G7 communiqué was couched in the claim  that the US is like a “piggy bank that everybody is robbing” through unfair trading practices. But piggy banks are for saving, and in the first quarter of this year, America’s net domestic saving rate was just 1.5% of national income. Not much to rob there! The same can be said of fiscal policy. Trump’s deficit-busting tax cuts and increases in government spending make no sense for an economy nearing a business-cycle peak and with an unemployment rate of 3.8%. Moreover, the feedback loop through the saving channel only exacerbates the very trade problems that Trump claims to be solving. With the Congressional Budget Office projecting  that federal budget deficits will average 4.2% of GDP from now until 2023, domestic saving will come under further pressure, fueling increased demand for surplus saving from abroad and even bigger trade deficits in order to fill the void. Yet Trump now ups the ante on tariffs – in effect, biting the very hand that feeds the US economy. So what Trump is doing is not about economics – or at least not about economics as most academics, political leaders, and citizens know it. Sure, Trump has been quick to draw on some fringe mutations of economics – say, Arthur Laffer’s infamous back-of-a-napkin supply-side musings  – but none that have withstood the test of time and rigorous empirical validation. Indeed, the pendulum of geopolitical leadership is now in motion. 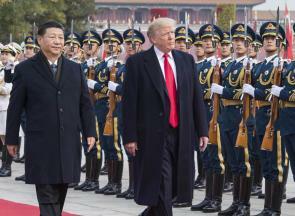 China’s massive pan-Asian infrastructure plan, the Belt and Road Initiative , together with its muscular behavior in the South China Sea , pose far greater threats to American hegemony than does one bilateral piece of a much larger multilateral trade deficit. At the same time, China’s recent efforts to build the institutions of an alternative financial architecture – spearheaded by the Asian Infrastructure Investment Bank and the New (BRICS) Development Bank – stand in sharp contrast to an increasingly inward-looking US. Much has been written about the historical trajectory of great powers and the military conflicts  that often arise during their rise and fall. This is where economics eventually comes back into play. Geostrategic power and economic power are joined at the hip. As Yale historian Paul Kennedy has long stressed , a condition of “imperial overreach” arises when the projection of military power outstrips a country’s shaky economic foundations. Can power politics offset the increasingly tenuous fundamentals  of a saving-short US economy that continues to account for a disproportionate share of global military spending? Can power politics contain the rise of China and neutralize its commitment to pan-regional integration and globalization? Stephen S. Roach, a faculty member at Yale University and former Chairman of Morgan Stanley Asia, is the author of Unbalanced: The Codependency of America and China . Copyright: Project Syndicate , 2018, published here with permission.